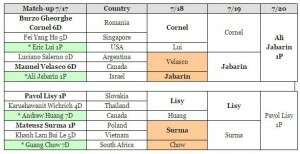 Twelve players from 11 countries competed in the Samsung Cup’s World Division among the 19-division preliminary in Seoul, Korea on July 20. Israel’s Ali Jabarin 1P defeated Slovakia’s Pavol Lisy 1P to earn a seat at the upcoming 21st edition of the Samsung. The first round, officially known as the Samsung Fire & Marine Insurance World Masters Baduk Championship, will be on September 6-8 in a double-elimination format. 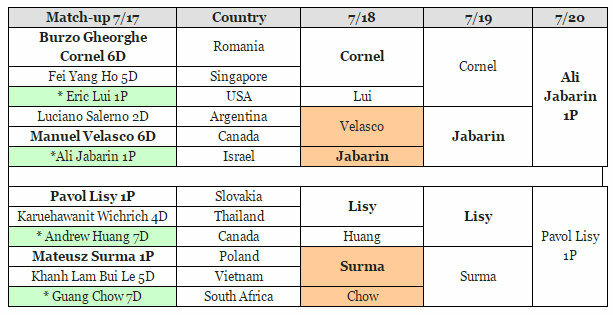 North America’s Eric Lui 1P (US) and Manuel Velasco 6D (Canada) both lost in the first round. See chart at right for the World Division’s full results. In the division semi-final on July 19, China won 19 of 22 critical matchups against Korea, and accordingly became a huge winner with 14 spots from the prelim. 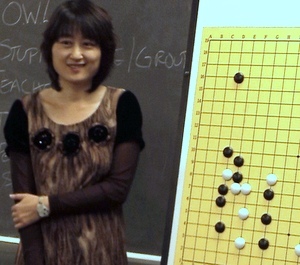 Complete prelim winners: Byun Sangil, Kang Seungmin, Cheong Tae-sang (Korea); Tan Xiao, Tong Mengcheng, Li Qincheng, Guo Wenchao, Fan Tingyu, Liao Xingwen, Xia Chenkun, Fan Yunruo, Cai Jing, Huang Yunsong, Tuo Jiaxi, Yu Bin (‘Senior Division’), Lu Jia, Rui Naiwei (‘Women Division’) (China); Ida Atsushi (Japan); Ali Jabarin (Israel). The 2016 U.S. Go Congress begins in just a week. 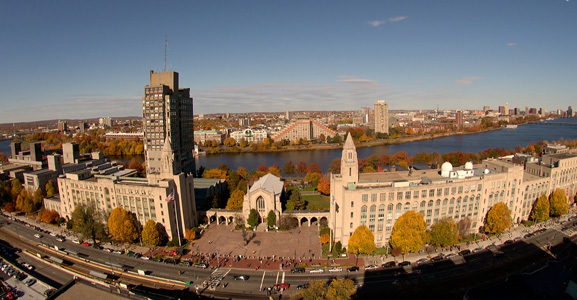 It will take place on the main campus of Boston University, which is located near the heart of Boston and along the Charles River. Boston is a fun and beautiful city during the summer: blue sky, Boston Harbor Islands, cool ocean breeze, good food, and beautiful people. It’s a vibrant city with about 152,000 college students. And it’s home to many innovative companies and institutes. Boston is also steeped in history. This was where the Boston Tea Party took place (some believe it’s the reason why we drink coffee today) and the first place in the United States to have a subway transportation system. The city was named after Boston, Lincolnshire, England, the origin of several prominent colonists. The original people of the area were the Massachusett, after whom the state is named. 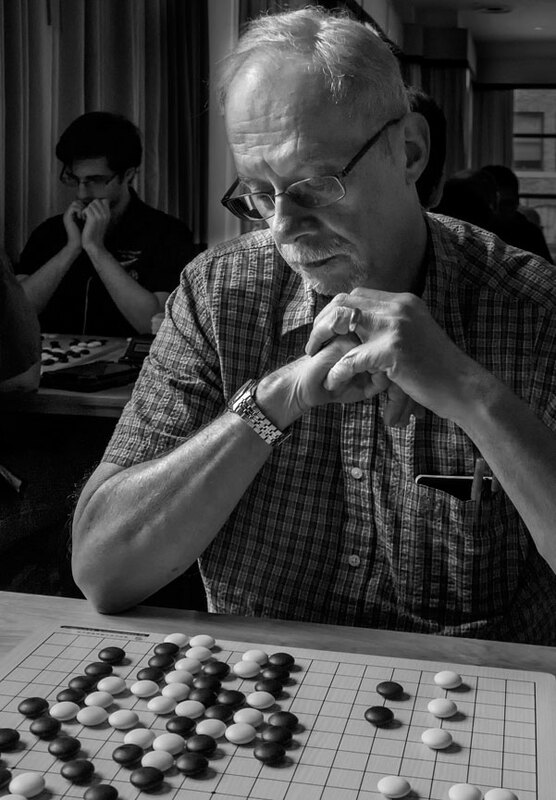 Go players who use the traditional day off on Wednesday to explore the city might enjoy dimsum in Chinatown, a walk around Boston Common and the Public Garden, a lunch at the Faneuil Hall, a ferry ride to one of the Boston Harbor Islands, a dinner at the North End, and/or drinks in Cambridge. Alternatively, you might enjoy a trip to the Museum of Fine Arts and an afternoon tea inside the Boston Library (at Copley Square) with its gorgeous paintings and architecture. For kids, the New England Aquarium and the Museum of Science are always the big hits. 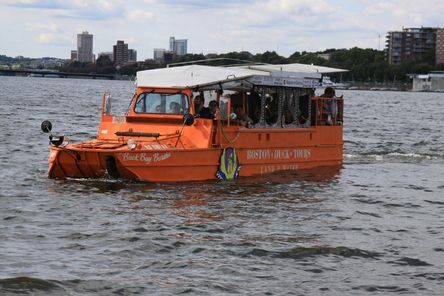 And of course, there are always the duck boats. See you soon! 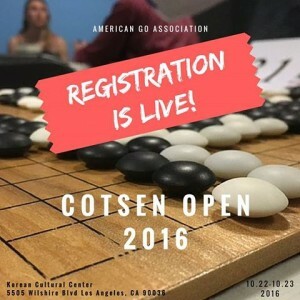 Metro Washington-area go players can get a taste of the upcoming US Go Congress next Monday, July 25 when Chinese pro Yang Shuang 2P — who will be teaching at the Congress in Boston — will play Josh Lee 6D at the NoVA Go Club, followed by a game analysis. The game will start at 7:30 pm at the club, which meets at St. George’s Church in Arlington at the corner of Fairfax and Oakland (ring the bell or call the cell phone number posted on the door). In other local news, a Back to School Special tournament is scheduled for September 10, the Richmond (VA) Go Club is back and will be having a fall tournament on October 15 and the Pumpkin Classic will be held October 29. Email garrett.p.smith@comcast.net for more details. The 2016 European Go Congress, which starts tomorrow in Saint-Petersburg, Russia, features many special events. One of them is a go/chess match between two chess Grandmasters. In one corner is Alexander Morozevich (right), three-time champion of the Chess Olympiad and two-time Russian Champion. He achieved 3k on KGS and played at some recent Russian tournaments. He started playing go as a hobby and enjoys studying and practicing. 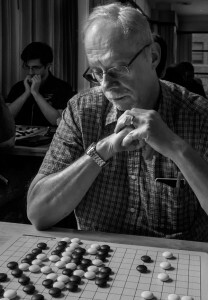 His opponent is a Swedish chess Grandmaster Tiger Hillarp Persson, also a two-time champion of his native country, and a winner of several individual bronze medals in the Chess Olympiad. 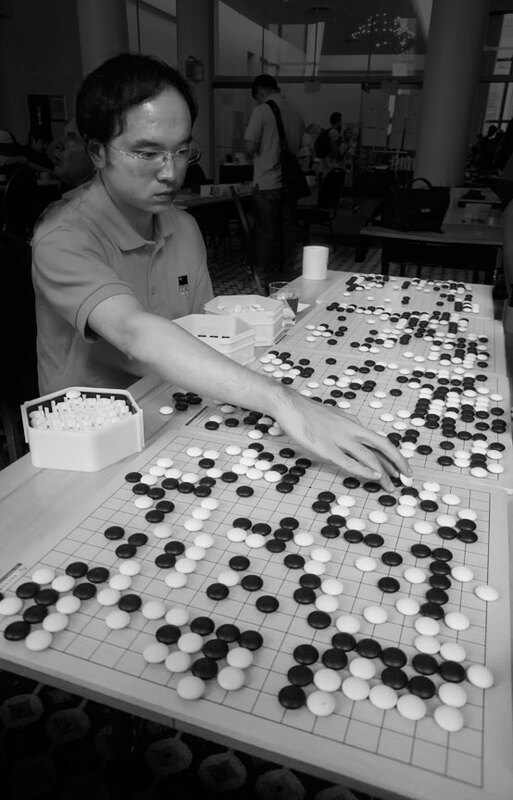 He started playing go in 2011 and reached 1 dan in 2015. 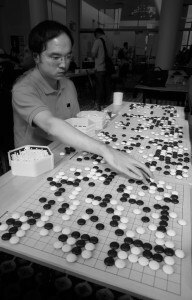 He believes that learning the principles of go can improve skills for all chess players. The match is scheduled for July 27 and will include two go and two chess games with reviews (and one additional match in case of a draw) and a simul with both Grandmasters. 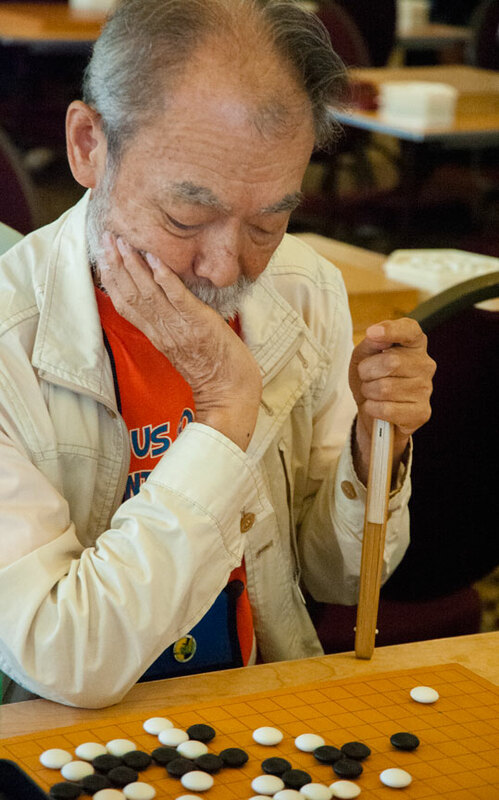 Organizers hope the event helps go to captivate more chess-lovers. Click here for more information. John Zombro, a life time Track and Field athlete and coach recently attended the Track and Field Olympic Trials in Eugene, OR and wrote up some of the things he learned from the character, philosophies and performance of the athletes. E-Journal photographer Phil Straus thought this list “is excellent for serious go players, as well for potential Olympic athletes” and sent along some illustrative photos. Intensity: When Joe Kovacs placed second in the shot put, and secured his place on the team to Rio, it was an excellent example of intensity. The shot put requires the athlete to concentrate all his/her power into less than a second. Kovacs finished fourth in 2012 and needed a breakthrough throw to make the team. The intensity of his place-garnering throw rocked the stadium as loudly as his roar, and the crowd’s applause. Aggression: Sometimes in life, and in sport, we need to be aggressive. There is no event where this is more true than in the 100 meters, and when Justin Gatlin toed the line for the final, it was all about aggression. Athletes learn to turn this on before an event, and turn it off soon afterward, but in the heat of battle, well, it’s all about the fight. Gatlin won the 100 going away in a true show of aggression. Confidence: Not to be confused with arrogance, confidence is that trait exemplified when an athlete refuses to have doubts, trusts his/her training, and is resolute to fully utilize talent and give a maximum effort. There were many examples of this at the trials, but none better than Emma Coburn in the women’s 3000m steeplechase. Coburn, easily the class of the field and a Rio medal contender, exuded confidence before the start and throughout the race. Humility: Bernard Lagat dropped out of the men’s 10,000 meters on a hot evening, unable to stay with leader Galen Rupp at the 7400 meter mark. At 41 years of age, Lagat, a champion many times over at 1500/mile and 5000m, just humbly commented that he could not stay with the leaders and was determined to come back in the 5000 and make yet another Olympic team. To the surprise of some, but not to others (including this author), when the pack exploded for the finish over the 5000’s last lap, Lagat took the lead in the homestretch and impressed us all. Poise: Brenda Martinez was in contention for a medal in the women’s 800m, when, on the final turn, her stride collided with that of Alysia Montano, and her chances of making the 800 squad were dashed. She did not blame Montano, and instead said the collision was a “blessing in disguise.” She stated “The track doesn’t care about your feelings, you’ve just got to move forward”. She did just that in the 1500m final, gathering herself to take the third and final spot on the team to Rio in a photo-finish. Focus: Molly Huddle, winner of both the women’s 5000m and 10,000m, in similar fashion, gave us a lesson in focus. She won both races by leading from the gun and then gradually pulling away from the field. 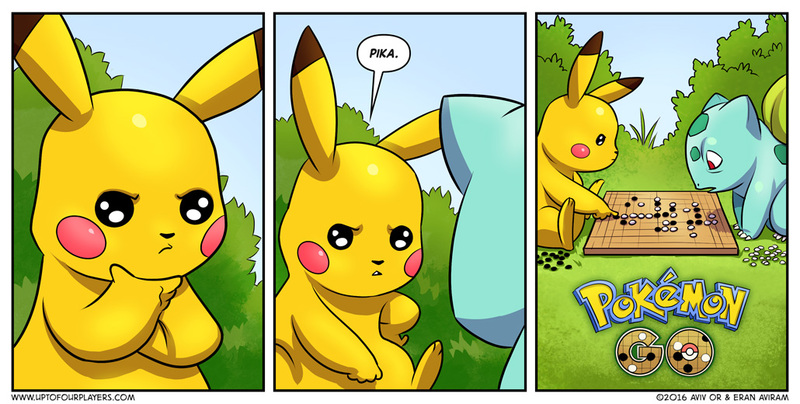 Her ability to concentrate is only matched by her talent and work ethic in training. Patience: Chaunte Lowe, the American record holder in the women’s high jump, a veteran at 32 years of age and mother of 3, convincingly won the women’s high jump. After a rather unsuccessful 2015, she patiently put in the training, and ruled the vertical leap. “I’m not quite done yet”, she said. Execution: Sometimes you just have to execute. Have a race plan and follow it, but also see what develops and react appropriately. Allyson Felix executed in the women’s 400m, displaying a homestretch gear that no one else could summon, and going 49.68 in the process. Still recovering from a severely sprained ankle from a training injury in April, Felix stated that she knew she had to be patient and use her sprinter’s speed in the final 100m, regardless of how her ankle felt or what the other runners were doing. Always a class act, she attributed her victory to her coach, physical therapist, chiropractor, and massage therapist. Executing her race plan effectively “executed” all competitors. Celebration: Occasionally we see athletes who deliver phenomenal performances but are never satisfied. “If only I’d trained harder, done this or that, or the weather was blank,” has been said a few times. But there is also something to be said for living in the moment. Sam Kendricks, in winning the men’s pole vault with a jump of (5.91m) 19’-4.5”, was jubilant in his victory. He took the microphone and thanked the athletes, the coaches, the spectators, and really shared the joy in his accomplishment. Kendricks was a graceful champion and captured the spirit of the trials. Appreciation: In this modern world, we sometimes lose track of those human qualities mentioned above. We have so many distractions in our connected, electronic, social media-driven world. However, I can say for certain that those Olympic ideals of striving to go higher, farther, faster, and to do it with honor and respect, were alive and well in Eugene and they are pulsating in our Olympians. Go USA!